This post has been a long time coming. 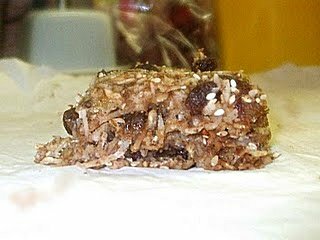 This is the third attempt in the granola bar/breakfast experiment and I made these shortly after the first two granola bar attempts... I didn't just give up on my father after he poo-pooed the first two. This is the recipe my dad originally chose (from the list of recipe options I gave him), but I had to wait for my bananas to ripen. That is why I experimented with the other two first. Anyways, this was the most successful of the three. He said he actually enjoyed them. I found that they tasted an awful lot like the Oat'Nana Pucks, actually. The only changes I made were to use coconut oil instead of canola oil and a whole cup of raisins for the dried fruit option. They were good...but nothing special. 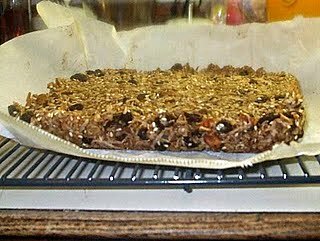 They were better than the other two granola bars, but I still haven't managed to find a granola bar recipe I think is worth making over and over again. None of them have had much of a granola bar texture...they've been pretty soft and mushy, while I've decided I want a granola bar with a crunch. For a time, Dad was taking two of these to work with him everyday...then, at the end of the week, I discovered his lunch kit (my Christmas gift to him) sitting on the stairs. I thought "what a strange place to put it" but, upon opening it, discovered the lunch I'd packed him for that day left completely uneaten... except for the three peanut butter cookies I'd included as a treat. Well, now I am back at school, too far to interfere effectively in my father's life...oh well. Sorry for the terrible picture quality, by the way...not only do I find myself baking at night most often and eager to photograph my baking right away, but I also have no photo taking skills, though I am trying to learn (via Googling...heh)! Since making these, I have learned the value of waiting for natural light and to be more careful with my angles. However, something extra funny happened to these pictures when I saved them from my desktop? Your dad is a good sport! I hate granola bars. Fathers are so annoying like that! How nice of you to keep trying to make food that he would like, though!